It’s almost New Bedford Bookfest time! More on that below. The Adventures of Strongarm & Lightfoot – Blades of Glory: Got some work in, but it’s still slow going setting up for the next big action sequence. 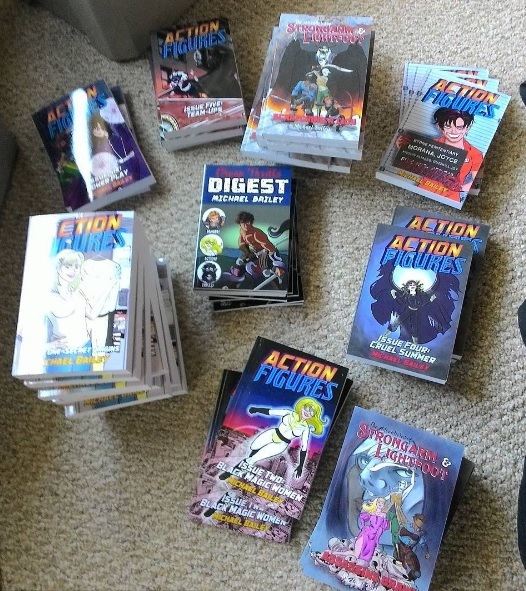 Action Figures – Issue Eight: Crawling from the Wreckage: I got a little work in on the second draft to keep me going while I puzzled out some stuff on S&L book three. THIS WEEKEND! Saturday, April 22 and Sunday, April 23, 11 AM to 4 PM: New Bedford Book Festival. I unfortunately won’t be able to make it due to my faire obligations, but my wife will be there to sell pre-signed books (as seen at right) and talk about my work on my behalf. Monday, July 31 through Friday, Friday, August 4: The Cape Cod Teen Writers Conference. I’ll be participating in the Author Panel Night on the final day (time TBA). NEW! Saturday, July 8, 3 to 5 PM: Annie’s Book Stop in Worcester is hosting a panel on superheroes in fiction, and I’ll be participating along with…other people. That’s all I know for sure. I have a hint as to who else might be there, but nothing has been officially announced. Thanks to my sweetie for her little nod to my work with the upcoming as fight director for Robin Hood’s Faire.